It is considered to be one of the most important knots alongside the sheet bend and bowline. Also known as a double hitch, it is simply 2 back to back half hitches around a cylindrical object such as a tree, ax or a post. It causes an efficiency loss of approximately 40%. The quick release knot can also be tied with webbing. It can be an interesting forest school activity. Its origin can be traced back to the first quarter of the sixteenth century when it was tied in ratlines. The evidence of this fact lies in early sculptures and paintings. The word clove is the past tense of cleave meaning split or divided. It is so named as there appear parallel lines of the rope at the back of the knot. The direction of pull in the 4th step should be opposite to each other. On repeatedly weighting and non-weighting the knot, it may loosen and may creep up the open gate of a non-locking carabiner. Hence it should never be kept unattended and is to be used with a locking carabiner. Instead of the linear support you can have a ring. You can finish it with a half hitch stopper back around the standing part to prevent slipping. 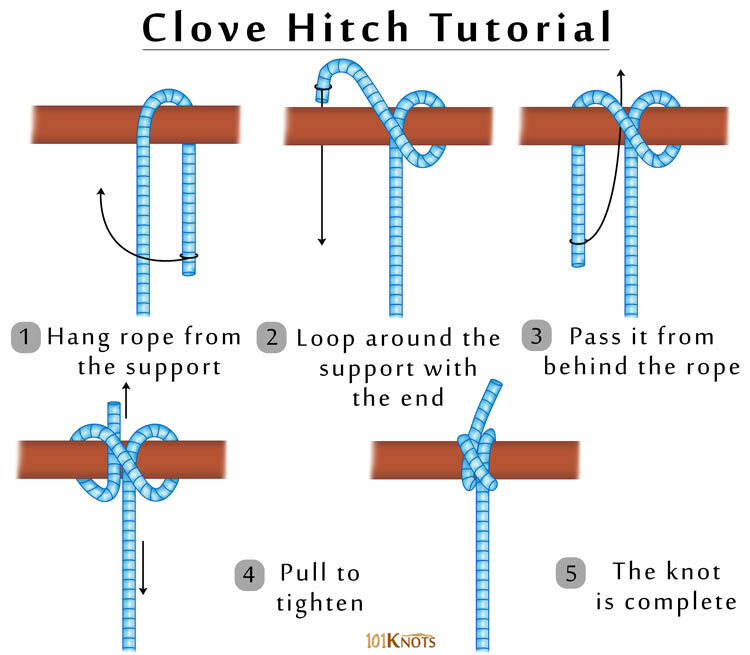 Double clove hitch – 2 extra turns are added to each arm to make this modified version. It increases the strength and safety. It is routinely used in windsurfing to join the mast to the boom. 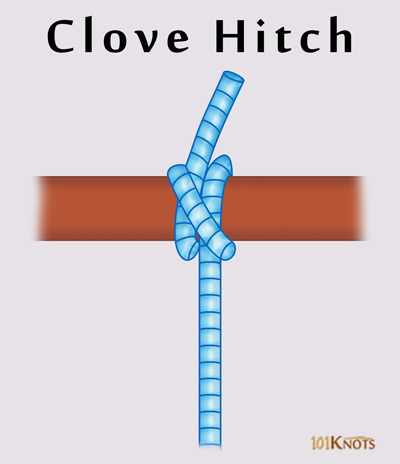 Clove hitch with a slip knot or slip clove hitch – It is the slipped version of the knot where instead of inserting an end in the last step, you pass a bight of rope. Girth hitch – Ties a climbing sling to various features. Munter/Italian hitch – It’s name signifying half clove hitch belay, it is chiefly used to control the rate of descent in belay systems by acting as a friction device. Rolling hitch– Serves the purpose of a stopper knot. It works well when the load applied is not perpendicular to the object, unlike the clove hitch. Cow hitch – The half hitches are tied in the opposite directions, unlike the clove hitch. Functions as a crossing knot. To start and finish a lashing such as the conventional square lashing in pioneering. For the master point in a fixed rock climbing anchor. Can also connect a personal anchor. By placing the knot on the spine of a carabiner you create a biner block that securely blocks against a rapid. In solo climbing (as it is safe for self-belaying on a biner) and for rappel transitions. In decorative macramé patterns (for eg. tying a square knot inside a clove hitch diamond). For tying bandages (arm slings) in case of injuries and for first aid. To tie a fender to a rail on a moving boat. The below tutorial depicts 2 methods of tying. The 1st one is identical to the procedure shown in the diagram. The 2nd one uses loops in the middle of a rope that are dropped over a post. It is also called the open-ended clove hitch. The first part of the 2nd method can be utilized in making the handcuff knot. The below video demonstrates how to tie it on a halyard for a ladder. You can apply it on extension ladders as well. It is tied on a bight and is useful for firefighting. Constrictor knot– Made similarly with a small difference. The tag end is passed under the intersection of the 2 adjacent loops in the last step.